I originally posted this last week as a note on my facebook page, but it sets the tone for this media-criticism-oriented blog, so I figure it’s worth a repost. It’s Martin Luther King Day, so I feel like I should write something. Because for some reason, Dr. King’s story and assassination struck a particular chord with me when I was younger. More specifically: he used to be one of my heroes. I remember cramming for the SAT II subject exam on American History in eleventh grade. I hadn’t taken the course, but I wanted to get the exam out of the way, so I was racing through a review/practice test book, attempting to learn the entire curriculum in a few weeks. Decades zipped along in bullet points — World War I, the roaring 20s, the Great Depression, the New Deal, Pearl Harbor, World War II, and so on until the Civil Rights Movement. Everything was treated with the same cursory lack of depth. African Americans did this, did that, Dr. King said this, organized this boycott, led this demonstration. All the stuff you learn in elementary school. But even — or perhaps especially — in the review book’s simplistic format, you could feel the momentum, the change, the progress, and it was kind of exciting. And that was it. Not another word about him. I remember reading those two sentences and my own reaction completely blindsided me: I started to cry. I once impulse-bought Dr. King’s posthumous, unauthorized autobiography at Barnes and Noble, because it was right there on the table and I just had to have it. I went around reading it for weeks afterward and always made sure to have the cover facing outward when I held it, because I wanted people to know who I reading about, because I took such pride in it. We take pride in our heroes. We fancy that who we admire, who we idolize or value or remember, says something about our own character. I’ve become hyper-aware of this during my past couple of weeks in Hollywood — there are literally thousands of stars embedded in the pavement on the Hollywood Boulevard Walk of Fame, and you cannot possibly take pictures of all of them if you want to get anything else done. You have to pick and choose, you have to prioritize. Who is worth stopping for? Whose star is worth taking a picture of? 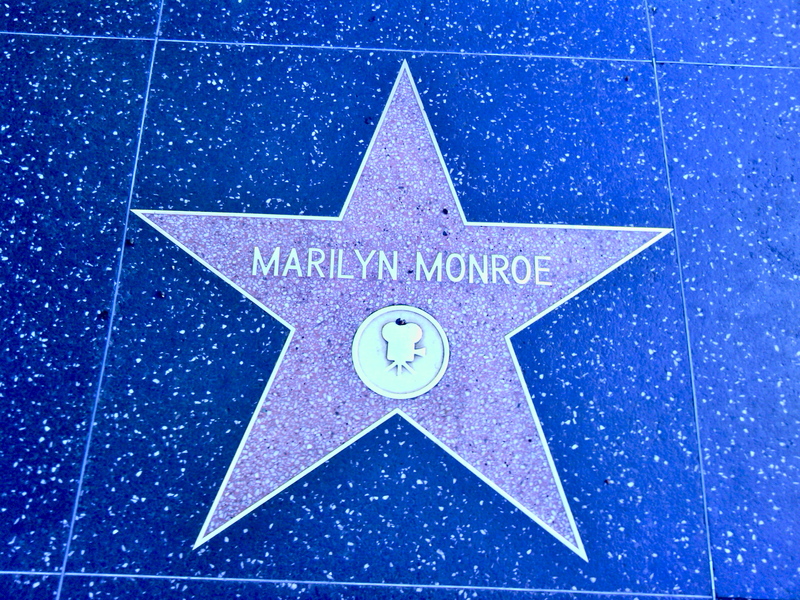 And then comes the question: Why is ANY star worth taking a picture of? It’s a hunk of concrete. You could probably google any star you want and find it in five seconds; why bother stopping and snapping your own photo? My point is, we at least partly identify ourselves by our heroes. If I’m a fan of old-time actors, I figure it says that my tastes run toward the elegant and the classy. If I’m a fan of the cast of Star Trek, and can recognize all their names from Shatner to Doohan to Nichols, it means I’m a nerd. If I’m a fan of celebs like George Takei and Neil Patrick Harris, it means not only do I value their talent; it means I value and respect the work they’ve done for the LGBTQ community. And so on. And here’s where I’ll stop using the word “hero,” because, as I mentioned in my last note, I don’t believe in heroes. I think that people are people, and that elevating others to a higher plane is just setting yourself up for disappointment. Everyone screws up, and if you look hard enough, you can always find the ugly side of people. So if you hold someone to a higher standard and expect more from them, you’ll probably just end up feeling betrayed and let down. Illusions are comforting and reassuring, but I prefer the truth, and the truth is that people are flawed. For the record, here’s useful distinction from a writing blog I once read on the difference between “imperfect” and “flawed” — imperfections are innocuous, like pimples or clumsiness; they show that the character is not a perfect construction, but they do no real damage to anyone. They are comfortable and safe and too many writers use them because of that. Flaws are ugly and unpleasant and cause genuine harm and pain to others. There is nothing safe or comfortable about them and writers are reluctant to use them because of that. Truly believable characters must have flaws, because all people have flaws. I can’t remember where or when I first learned that Martin Luther King Jr. was a womanizer who cheated on his wife. We feel betrayed when our so-called heroes fall. Betrayed by them and betrayed by the world that somehow conspired to raise these people in our consciousnesses, when they were in fact unworthy. I’m sure there are plenty of people out there who right now are feeling this way about Lance Armstrong, who have felt this way about any athlete who cheated or has been strongly linked to cheating, whether it was Mark McGuire or Sammy Sosa or Roger Clemens. But it’s not easy to separate the person from the achievement, and the feelings of betrayal from the actual crime. A commonly proposed solution to such a dilemma is “empathy.” Empathize with your fallen hero, and be forgiving, and then perhaps you can still appreciate their legacy without the dark clouds shadowing it. This may surprise some people, but I’m not big on empathy. I was not blessed (or cursed) with an abundance of it. The fact that I cried while reading a history textbook that one time was shocking to me. With very rare exceptions, I am not one of those people who can feel someone else’s pain. I was, however, given an abundance of understanding, which is not the same thing. Empathy is emotional; understanding is rational. I understand so many things that I cannot fathom emotionally. I can recognize patterns and draw parallels and see people’s behaviors and environments and common themes threaded repeatedly through human nature, and the circumstances surrounding people’s actions, and just get why they do what they do, no matter how outlandish or inexplicable it might seem to some. A relatively new acquaintance once said to me, “It’s like you’re reading my mind from the future and saying things before I think them,” and a different friend once said of my writing, “It’s like, these are my thoughts, but you’re wordifying them.” I don’t in any way claim to speak for everyone, but I seem to have a knack for getting inside people’s heads using nothing more than logic. I understand things, but I can’t empathize. So that’s my approach to heroes, or to the people society might consider to be heroes. I try to keep them firmly on the ground so that they remain people, and people can be understood, either rationally, or (if you happen to have the wiring for it) emotionally. Understanding is the first step to forgiveness, and forgiveness is one of those vital life skills that isn’t taught in school but is needed to survive, because not only are all people imperfect, but they are also flawed.